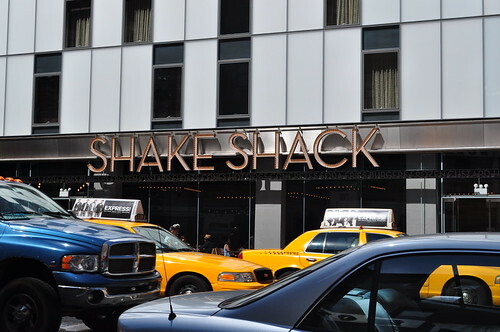 I ate many a lunch at Danny Meyer's Shake Shack (I fear counting, haha), either with Marcus at the original location at Madison Square Park or with co-workers at the newly opened for 2010 location in the Theatre District as it is so close to my office. The flashing lights of the sign make it a perfect fit for Times Square, as it is the only Manhattan neighborhood with zoning ordinances requiring building owners to display illuminated signs! Go figure! 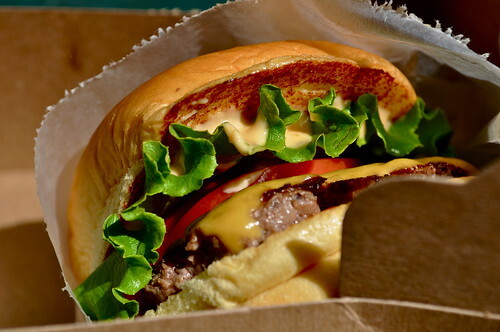 Price point: $4.50 for a single ShackBurger. 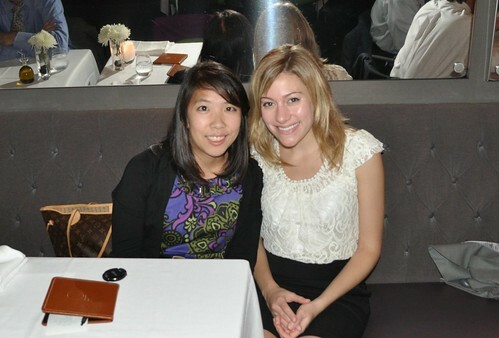 My co-worker, Jess, and I went to Alto (formerly Michael White's restaurant with Chris Cannon, now solely Chris Cannon's) at the end of September as a nice break from work. We had some pretty good dishes here. We started with terrina di coda, a country-style oxtail and foie gras terrine. Jess had the gnocchi con pomodoro San Marzano with Russet potato gnocchi, slow-cooked San Marzano ragù, and basil. I had the risotto milanese con astice e midollo which was a Milanese-style saffron risotto with poached lobster and bone marrow. All were lovely! 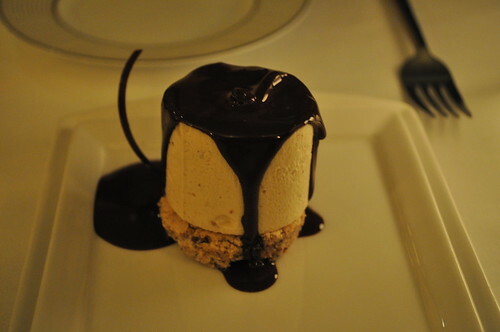 And last, but not least, was one of the desserts we had, which was torrone, Piemontese nougat semifreddo, hazelnut cake, and a warm chocolate sauce. So good--a nice crunch, chewiness, and sweetness all rolled up into one! Our other dessert was the chocolate millefoglie, consisting of layers of chocolate crunch, white chocolate creme, blackberry sorbet, and chocolate caramel tulle. Price point: $19 for the antipasta, $16-18 for each pasta, and $17 for 2 dolci. 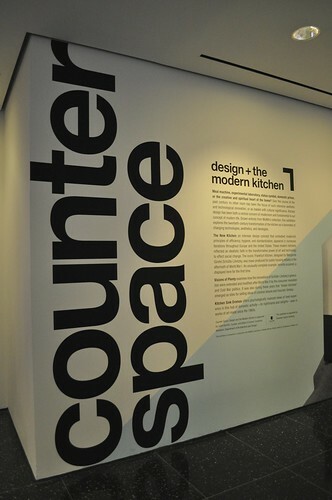 Marcus and I went to the Counter Space exhibit at the Museum of Modern Art (MoMA), which "explores the twentieth-century transformation of the kitchen." 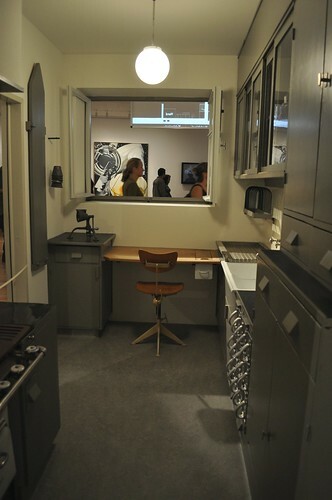 The exhibit also highlights MoMA’s recent acquisition of an unusually complete example of the iconic Frankfurt Kitchen designed in 1926–27 by the architect Grete Schütte-Lihotzky (seen above). Price point: $20 general admission. 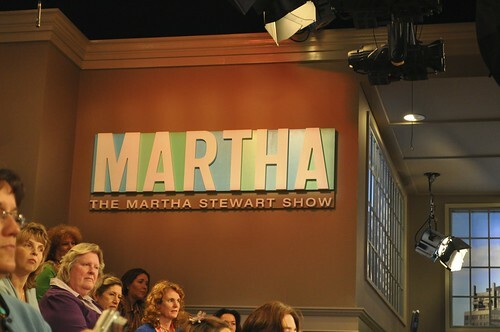 I finally was able to score tickets to a live taping (on October 6) of The Martha Stewart Show (my third successful attempt) and actually be able to go! This show included a recap of Martha's past kitchens (her first kitchen was made with her husband using an old sycamore tree)! She also mentioned her love for pot racks and her "Great Wall of China" (a wall lined with fine china)! 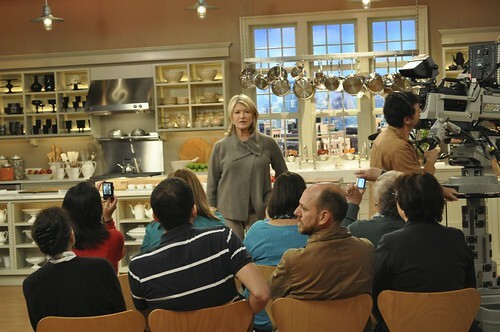 The next segment surrounded kitchen renovations by Martha Stewart for Home Depot, her new kitchen design line! Also, coincidentally, the curator of the MoMA exhibit, Counter Space, Juliet Kinchin, was a guest on the show that day, displaying and demonstrating kitchen tools that appear at the museum. Martha even mentioned she wrote a review in The Observer about her recent visit to the exhibit. The next guest on the show was Rachel Saunders, the founder of Blue Chair Fruit Company. She and Martha were making early girl tomato jam on the show together. Blue Chair makes a wide variety of jams and marmalades, and it even has a new cookbook available for sale now! Each audience member that day received a copy of it, along with some jam from Blue Chair! Here is Martha having a Q&A session with the audience members, followed by the last segment that day, which was making specimen frames. 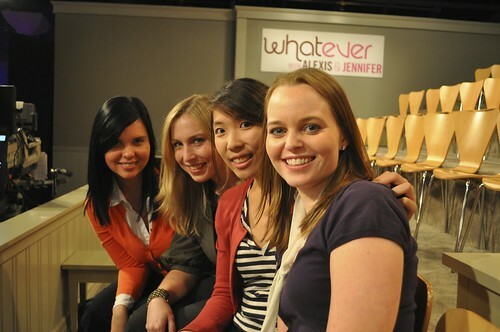 Lucyanna, Kellie, me, and Eleanor in the audience! 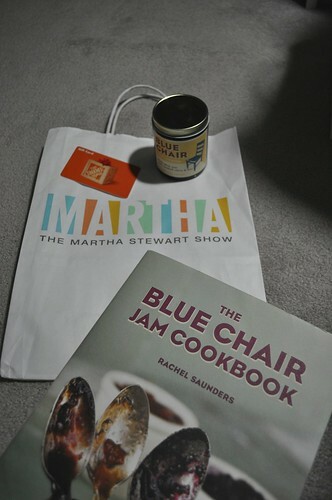 The SWAG we got that day: a $25 Home Depot gift card, The Blue Chair Jam Cookbook, and a jar of jam from Blue Chair! Price point: tickets are free, find more information here! 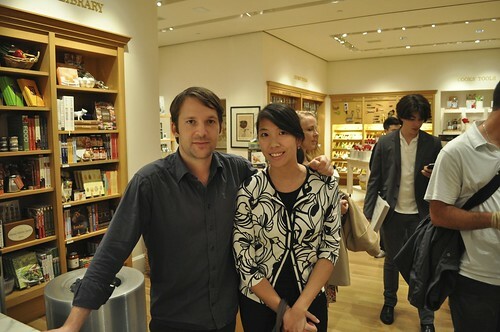 I got to meet René Redzepi, well-renowned chef of S. Pellegrino's #1 restaurant in the world, Noma (in Copenhagen) at a book signing hosted by Williams-Sonoma at Columbus Circle back in October, the day after his lecture at the New York Public Library. 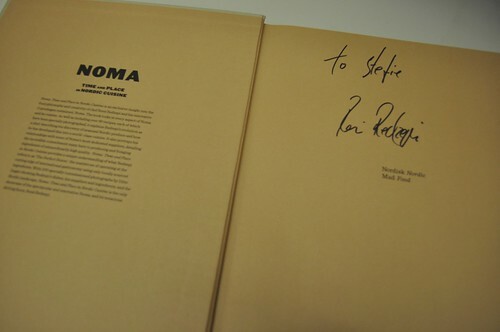 Here's my signed copy of NOMA: Time and Place in Nordic Cuisine! Price point: $49.95 for each book. After the book signing with Chef Redzepi, I decided to grab a quick dinner at Marea before heading to a concert with co-workers. 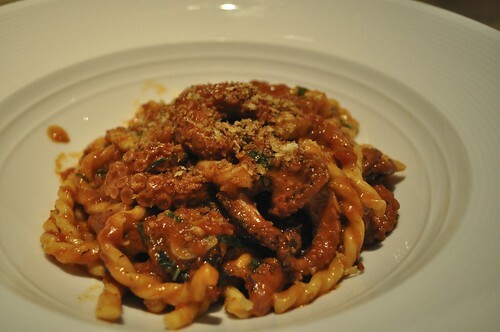 During my first visit to Marea, I really wanted to order the fusilli with red wine braised octopus and bone marrow. but was so torn that I went with the agnolotti instead. Later, I read on Eater that Thomas Keller said that his single best dish of 2009 was this very one, so I promised myself I would go back to Marea to have it. It was so rich and savory--just the right amount where I didn't feel overstuffed. I would love to go back to have this dish again soon! Price point: $31 for the pasta. I'll post the other half of the Blog-Shy of 2010 tomorrow!